Companies that make and distribute food products are subject to stringent regulations to maintain safety and quality standards for ingredients, raw materials, and finished products. At the same time, they run the most efficient and profitable operations they can, creating and providing products for their customers. Introducing new products typically comes with the high risk of creating supply chain and production mechanisms with uncertain consumer adoption. It’s a tough balance, especially when you consider the many uncontrollable elements that also impact the food business – including weather conditions, soil quality, seasonal fluctuations in consumer demand, even political conditions in the countries where farmers and suppliers are located. Uniquely in the food industry, the quality of produce, fruit, milk, or other supplies at their point of origin predetermines the business outcome of the manufacturing and distribution processes. Forward-looking food companies understand that it’s of benefit to them when the contributors at any stage of the supply chain and production operations are closely connected. For example, the findings of roaming agronomists assessing soil qualities, climate conditions, and the likely yield and quality of farming operations need to be available to purchasing and production planners at a food company, so they can make the right decisions. Evidence of shifting consumer preferences and buying patterns should be recorded in the retail and hospitality environments where they play out, and relayed to the food manufacturer’s decision-makers. Traditional business intelligence and computing systems often lack the depth of field and flexibility to help food company planners and production managers take advantage of wide-ranging collaborations and make smart, timely decisions that are based on data. That’s when cloud computing, including the use of advanced business insight tools available in the cloud, can help food companies connect all the contributors, collect and process any data evidence that matters, and take the right action when it still makes a difference. Take a look at the short, fun animation we’ve prepared to get a sense of what the cloud can help food companies accomplish. Instead of investing in expensive software licenses, servers, networks, data storage, security technology, telecommunications, and whatever else you need to set up a data center, in the cloud you can access these resources immediately. Many times, if you take a certain workload or proof-of-concept to the cloud, you can be in production within hours or minutes. Advanced business intelligence tools available from the leading cloud providers help you make sense of the data and events that impact your business. To give your planning and decisions substantiation and a wider perspective, you can complement your own business data with cloud resources such as OpenFDA in the U.S., where the Food and Drug Administration (FDA) offers its own data volumes for your analysis and reporting. The cloud connects mobile and roaming contributors and data sources to your processes. This becomes especially effective if containers, facilities, distribution systems, and weather stations are connected to the internet of things (IoT), so they can generate data for analysis in the cloud. You can track raw materials and produce from the farm, through the supply chain, to your production. In real time, you can follow quality assessments that tell you about freshness, environmental conditions, or other measures. If there’s a procurement delay, you can identify alternate sources before your production is disrupted. At the other end of the process, if a sudden increase in demand needs to boost procurement and production, your cloud-based intelligence helps you act on the opportunity before some competitors are even aware of it. Columbus food industry experts have helped many food companies grow and increase their long-term business viability, taking advantage of business insight and computing capabilities easily accessible in the cloud. With Microsoft Dynamics 365 in the Azure cloud, superior analytics and business management functionality is available to the food industry. We can help you make a smooth, controlled, predictable transition to cloud computing, so you can stay focused on what you do best – create, make and distribute food products. 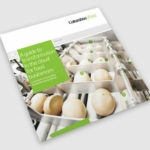 To begin transforming your business in the cloud, take the next steps: Go to http://www.columbusglobal.com/en-us/resources/cloud-transformation/food to read our e-book, A Guide to Transformation in the Cloud for Food Companies. Then, get in touch.